If you could travel back in time, would you like to immerse yourself in the dawn of Peranakan culture? 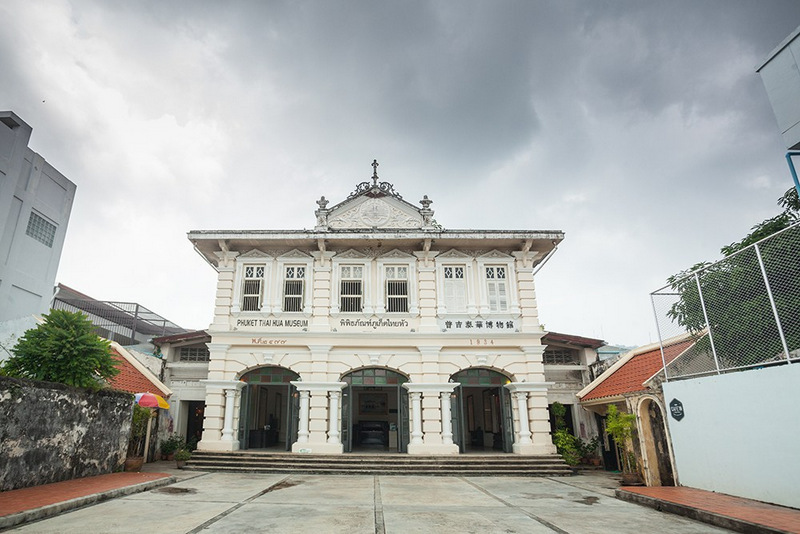 This fascinating marriage of Sino-Portuguese communities, that in the 19th century developed their cultural identity, lives on today in Southern Thailand and is also responsible for some of the region’s most remarkable architecture. It all started in Phuket. By the middle of the 19th century, as the island’s tin mining industry grew, it became an important trading hub on the Andaman Sea. Tin mining was an important revenue source and major commodity for the wealthy Phuket elite. These mines were developed by the British in Kathu district as early as 1830 and then in Thalang around 1860. Mining particularly attracted Chinese workers and traders who mostly came from Penang in the then “Malaya”. 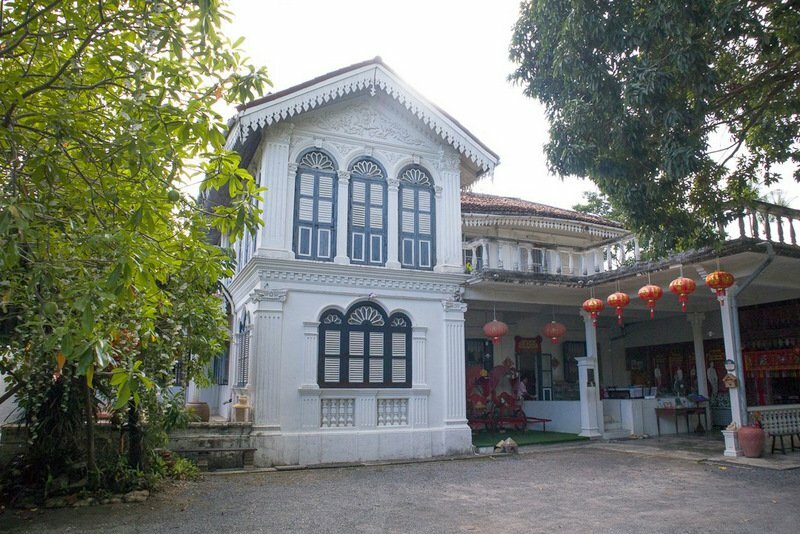 Many stunning examples are clustered along Krabi Rd, Yaowarat Rd and Dibuk Rd where some villas were converted into museums, such as the beautiful Thai Hua Museum that recognises the Chinese community or the imposing Chinpracha Mansion still owned by the same family. Others are now restaurants, the most impressive being the former Governor’s residence, superbly restored as the Blue Elephant Restaurant. Along Soi Romanee, Dibuk Rd, Thalang Rd and Yaowarat Rd stand rows of shophouses beautifully restored with their classical columns, bas-relief and colourful tiles. Some are now small boutique hotels and available for very decent rates. Moving north of Phuket, visitors can travel to Phang Nga province and discover the provincial town of Takua Pa, another important centre of tin mining in the first half of the 20th century. The town’s main road is lined with the ubiquitous shophouses. Takua Pa recently found its revival spirit with new cafes and small inns opening, probably seduced by the old town charm. 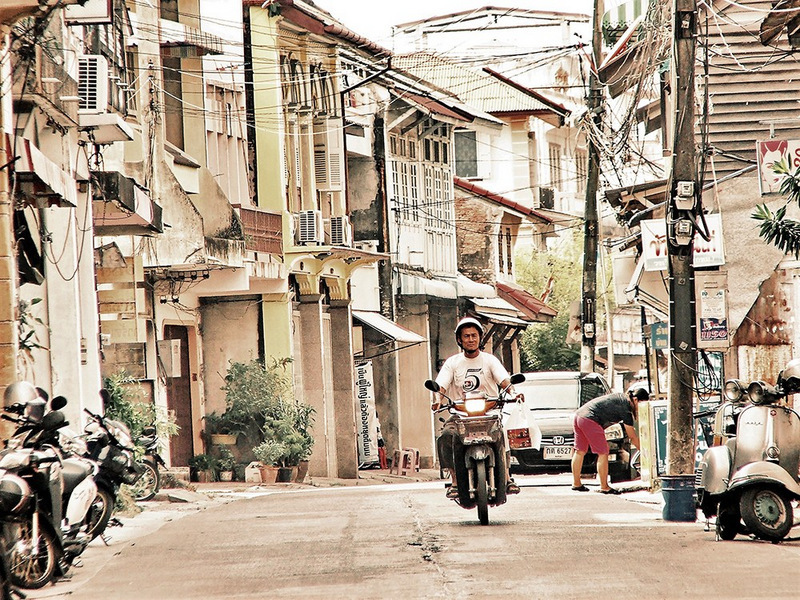 And like in nearby Phuket or Penang, Trang is full of houses built in a simplified Sino-Portuguese style. 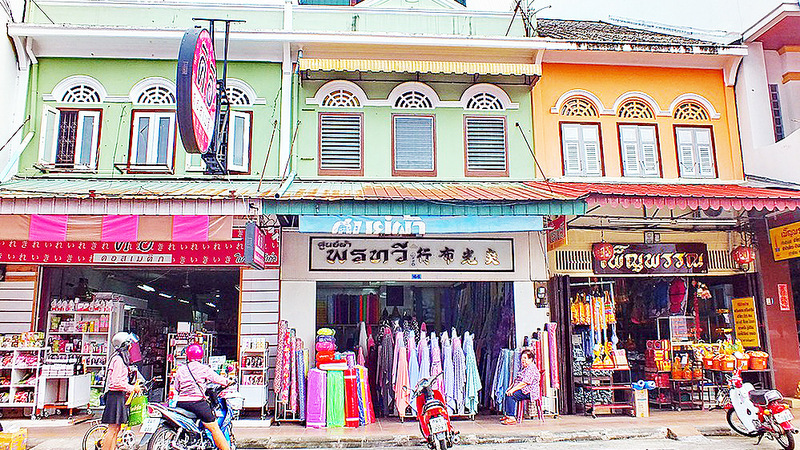 Walking around the streets of the historical centre of Trang around the railway station and the market, visitors can discover many of these shophouses. 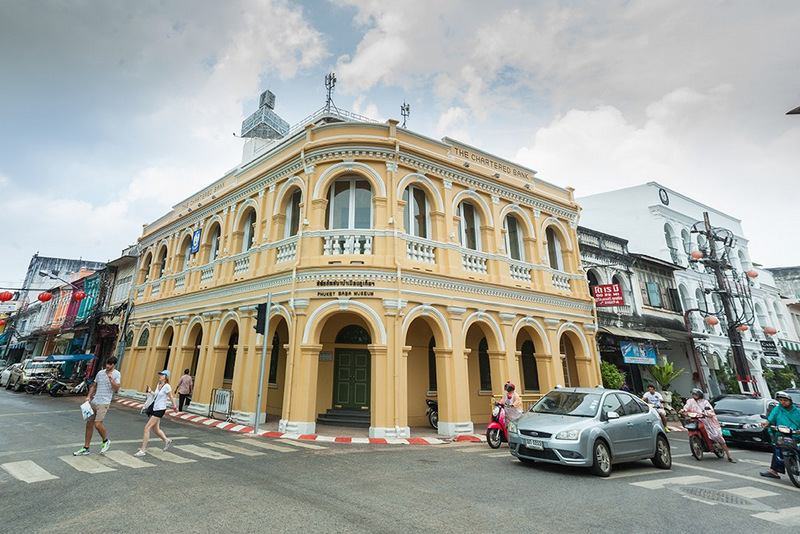 Most historical houses in Trang can be found between Kantang Rd, Sathanee Rd and Ratchadamnoen Rd. A simple, retro lifestyle represents this low-profile city and will surely take travellers back in time in Thailand as it used to be in the early 1970s. Over in Songkhla province, just over the mountain range to the east and easily accessible by bus, Songkhla Town’s historic old town is bordered by Nakhon Nok Rd, Nakhon Nai Rd and Kao Hong Rd (also called Nang Ngam Rd). 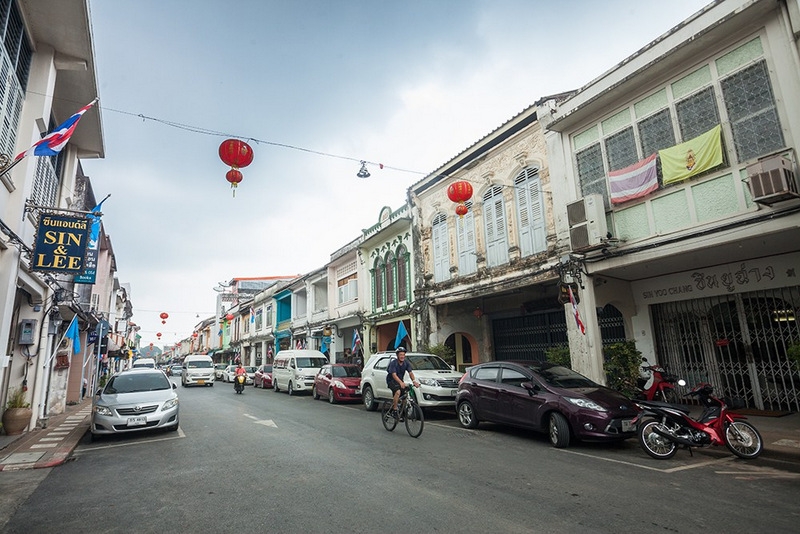 Songkhla Town’s old town is one of the best Sino-Portuguese preserved cities in Thailand, as it still has three to four dozen old-style houses. They are decorated with stucco, Ionic or Corinthian columns. Each is still part of Songkhla’s lively heritage, as many are still owned by the same families, many for more than 100 years. Others are home to biscuit and cake makers, small craft shops, coffee outlets and restaurants that are all around the old town with families still living and working there for generations. Then there are two of Songkhla’s not-to-be-missed iconic buildings. The National Museum, which used to be the private residence of Songkhla Vice Governor Phraya Sundranuraksa. Its design is mostly inspired by Chinese mansions. However, it also has many European flourishes; such as, a grand staircase and arched galleries. And it is impossible to miss the strong red façade of the Hub Ho Hin Rice Mill, a factory that was built according to British standards and equipped with steam engines from England. It was used as a rubber storage house and now serves as a private pier for small boats. Note: This is the second of the five-part story on European architectural heritage in Thailand written by Luc Citrinot, a freelance journalist and consultant in tourism and air transport with over 20 years’ experience, for the Tourism Authority of Thailand (TAT).